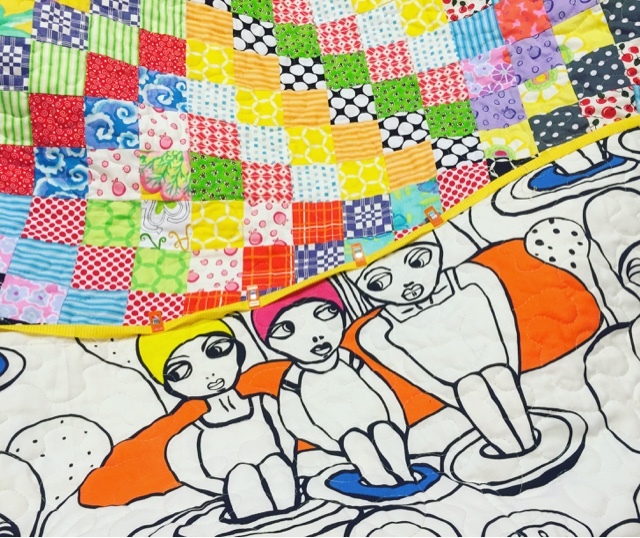 Being the sheep that I am, when I saw the Trip Around the World quilt appear on blogs and social media, I just had to make one too. It was fun finding strips in my scrap tubs, to put these simple blocks together. 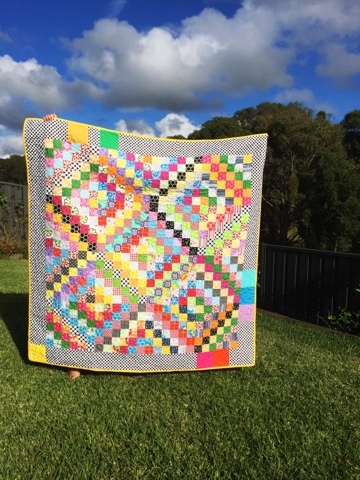 Wind that clock forward 3 years, and I found my scrappy version of this quilt sitting in the bottom of a scrap tub. I had completely forgotten about it. At the time, I remember thinking that it was a little too small and I'd like to make more blocks to finish it... another day. Honestly, it's never going to happen. I've added a black and white spot border with a few solid squares thrown in (I didn't have quite enough border fabric). 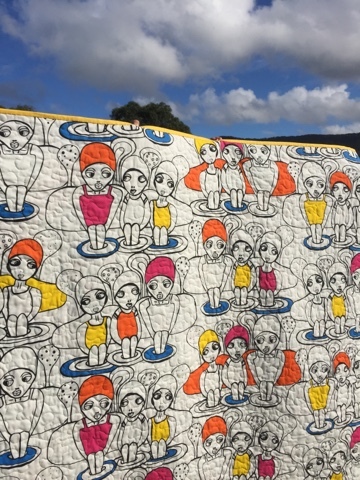 I quilted it in a meandering free motion design using my favourite light grey 50wt Aurifil cotton - #6726. I adore this backing fabric. I've had it on my shelf for the longest time. I bound the quilt in bright yellow over the course of a couple of evenings watching "Outlander" on Netflix. I'm happy to report that's now finished! Yaaaaay! My little helpers held it up - on their tippy toes, so I just know it'll be a great size for snuggling on the couch this coming winter. Did you join in the trip along, back "in the day"? Did you make a scrappy version, or were you controlled with your fabrics and colours? Get er done, get er done! lol, a nice finish! 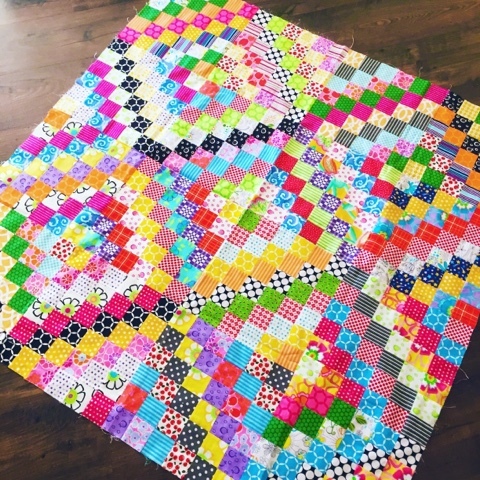 I love the border - those solid squares are fabulous (I'm glad you didn't have enough of the spotty fabric!). My mother and her friends called this design "Step Around the Mountain" -they didn't venture that far from home to go around the world. Thank you for helping me feel not so much as a slacker. I, too, saw the pattern and I even made one square to see how easy it was to do so. Then I started cutting one WOF whenever I was cutting out something else - thinking I'd save them until I had enough variety. Well, I keep using the 2.5" strips for other things and I've never had enough willpower to just sit down and make the Trip (ha!). Good job. Great idea for adding the solids to make the border fabric stretch. I'm going to steal this idea.